Keith Ferguson. Courtesy of the Austin Chronicle. Image available on the Internet and included in accordance with Title 17 U.S.C. Section 107. 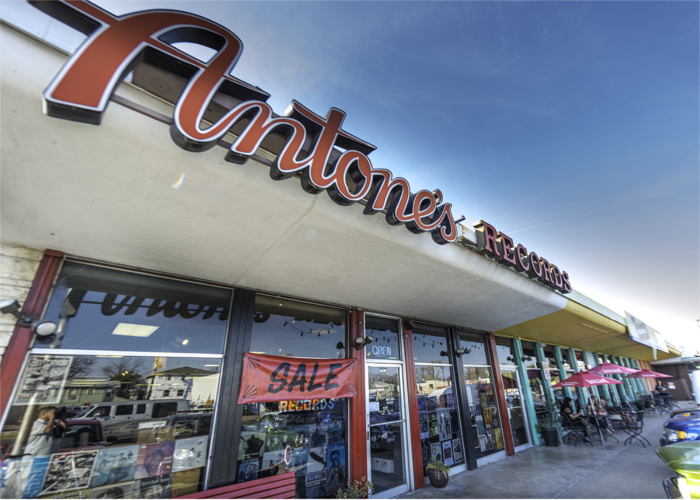 Antone's Records Shop. Image available on the Internet and included in accordance with Title 17 U.S.C. Section 107. 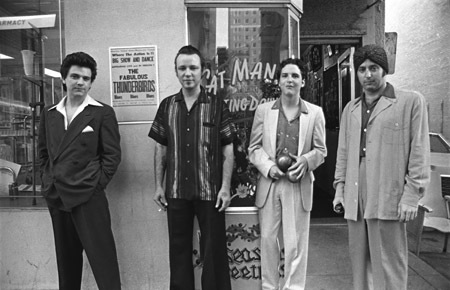 The Fabulous Thunderbirds. Courtesy of the Austin Chronicle. Image available on the Internet and included in accordance with Title 17 U.S.C. Section 107. FERGUSON, KEITH (1946–1997). Blues and rock bassist Keith Ferguson was born on July 23, 1946, in Houston, Texas. He was the son of John William Ferguson. He was raised in the Sixth Ward, Houston, and graduated from San Jacinto High School in 1964. The tremendous ethnic diversity of Houston provided a rich cultural environment for Ferguson’s musical upbringing. As a youth he was strongly influenced by local black and Hispanic musicians. In fact he reportedly learned to play from one of the members of a leading Hispanic musical family, the Compians. At the age of twenty, Ferguson began performing in local venues, such as the Suburban Lounge, the Polka Dot, and Guys & Dolls. He also teamed up with guitarist Johnny Winter who had recently moved from Beaumont to Houston. The Tail Gators' Album Cover for Mumbo Jumbo. Image available on the Internet and included in accordance with Title 17 U.S.C. Section 107. By 1975 Ferguson, along with Jimmie Vaughan, Kim Wilson, and Mike Buck, had formed the blues band, the Fabulous Thunderbirds. For a time the group served as the unofficial house band for Antone’s nightclub. He was married to blues vocalist Lou Ann Barton for a short time, but the marriage did not last. The Thunderbirds performed in venues across Texas and in Boston and released several albums on the Chrysalis label, although the record company dropped the band from its roster in 1982. Ferguson played on the first four albums of the Thunderbirds and was part of their collaboration with Carlos Santana on his Havana Moon (1983) recording. By 1984 Ferguson, who had parted ways with the Fabulous Thunderbirds, had formed the Tail Gators with Don Leady. The bassist co-wrote the title track for that band’s Mumbo Jumbo (1986) album. He also played with other bands, including the Solid Senders and the LeRoi Brothers. Playing what writer Josh Alan Friedman described as “a swinging elephant trunk of bottom beneath every song,” Ferguson was voted best bass player at the Austin Music Awards in 1985 and was inducted into the Austin Chronicle’s Texas Music Hall of Fame in 1997. Keith Ferguson died in Austin, Texas, on April 29, 1997, from liver failure, due in part to a nearly thirty-year addiction to heroin. He was inducted into the Austin Music Memorial in 2011. Austin Chronicle, May 2, 9, 1997. My Tribute to Keith Ferguson (http://www.angelfire.com/ma/rockincatbass/keith.html), accessed May 18, 2006. . Detlef Schmidt, Keith Ferguson: Texas Blues Bass (Anaheim, California: Centerstream Publications, 2014). Handbook of Texas Online, Shaun Stalzer, "FERGUSON, KEITH," accessed April 25, 2019, http://www.tshaonline.org/handbook/online/articles/ffe28. Uploaded on July 15, 2014. Modified on February 13, 2017. Published by the Texas State Historical Association.